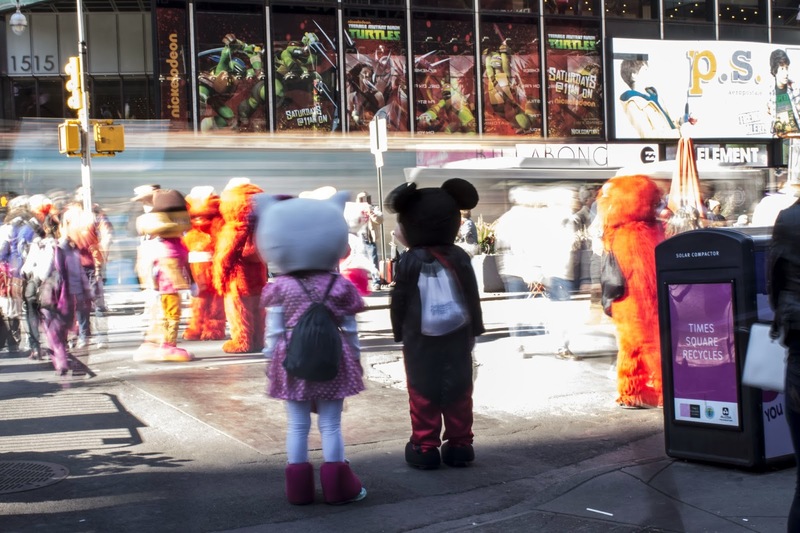 My feeling toward the numerous bootleg versions of popular characters that hang out in Times Square posing for photographs is an evolving thing. 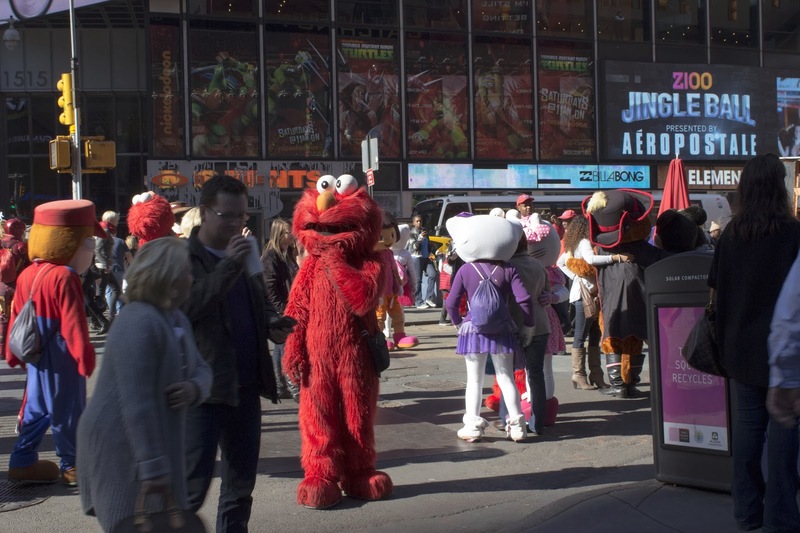 When this phenomenon of a couple Elmos posing for photos a few years ago somehow morphed into what it now is - people in raggedy outfits of various recognizable cartoon figures or superheroes - I found the spectacle creepy and yet another corporate and branded thing about Times Square to detest. However, now a couple years later, I have come to appreciate these characters so much more. I am so fascinated by them and I also like the effect that they have. 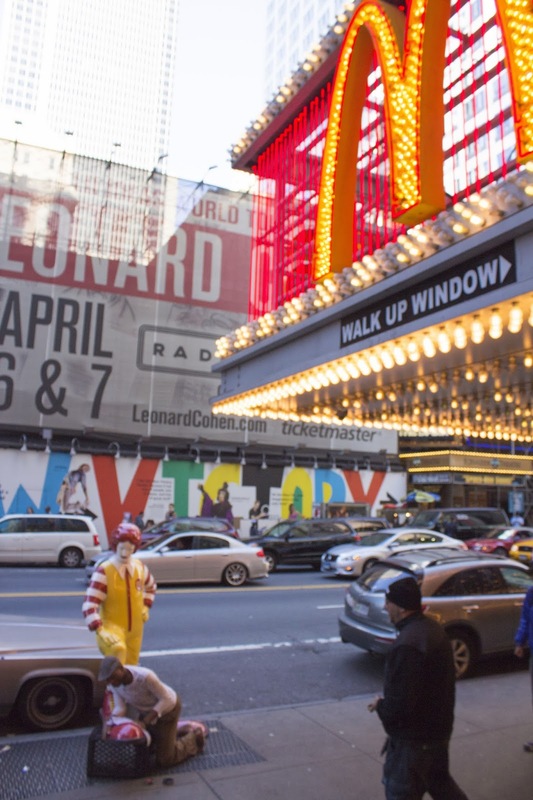 In some way, they are bringing the seediness and creepiness back to Times Square. 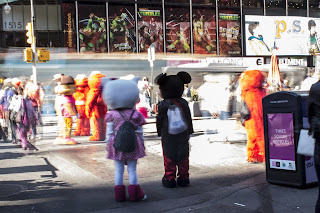 There is something very funny about how Times Square was originally cleaned up back in the '90s with the help of Disney and now a couple decades later, it is people desperate for money dressed up as various Disney characters (as well as Marvel and Sesame Street characters) who are making Times Square seem somehow more menacing, and in the process undermining all the money these protective brands spend shaping these character's identities just so. I sat and watched them for quite a while today, photographing them every now and then. They would occasionally all huddle or one would lift the head of their costume to peer at how much money was in their tip bag. Later in the day, when finally leaving this part of town, as I was going down the subway stairs, I passed four Central American guys changing out of their costumes at the bottom of the stairs. 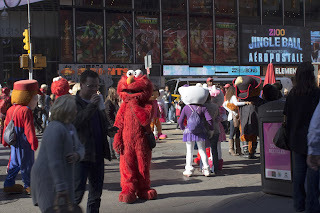 It is pretty insane to think that there are men and women who have immigrated to this country and find themselves in Times Square dressed in various ratty outfits portraying these icons of huge corporations for tips from visiting tourists - Mario, Batman, Hello Kitty, and of course Elmo, so many Elmos. I can't imagine that back in whatever place they immigrated from, that this is what they thought they would be doing in a new country. 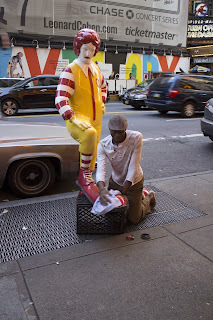 In front of the McDonald's on 42nd Street, I came across a Bansky art piece that has been making its way around to various McDonald's in the city - an angry looking statue of Ronald McDonald with his shoe out to be shined, and an actual shoeless black man shining this statue's shoe. It made me deeply uncomfortable to encounter this, but that's probably a good thing. There were numerous tourists who took pictures of this in the same way they did of the guy putting nails up his nostrils next door at Ripley's Believe it or Not or of the various Elmos a little further down the street, one more crazy sight that they encountered on their trip to New York. It's a really great work that speaks a lot to these times we live in. 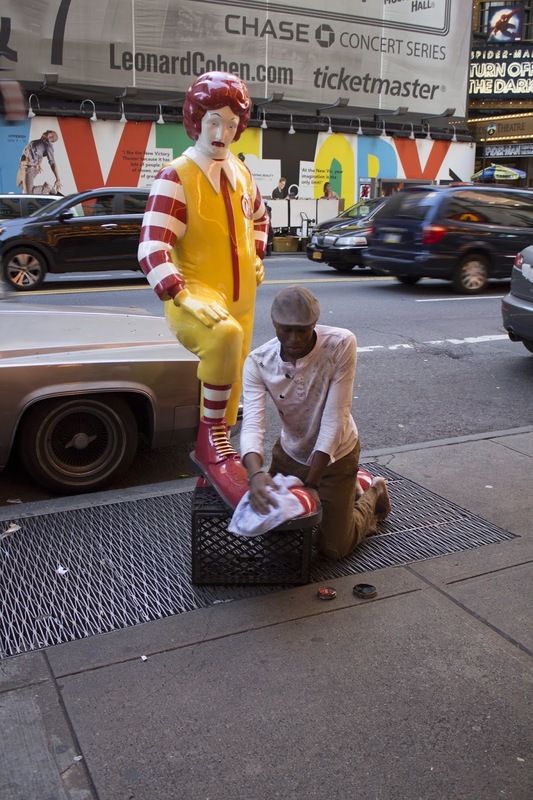 I couldn't help but notice some symmetries between the characters all over Times Square making messes of various brands and this Bansky piece as well. I went and saw Gravity at the Regal on 42nd. When I left the theater, the Bansky installation was already gone. I walked down the subway and passed the group of guys changing out of their costumes, counting their tips, happy.